The photo was taken with a Holga 120 CFN, for which I paid $ 30 dollars on eBay. It was loaded with Kodak color film (Kodak Pro 160). I sent the film to develop but I do not own a scanner (and can’t afford one at the moment for scanning 120 film). The person who usually scans my film has been extremely busy, so I had the rolls for two months in the cupboard. A couple of days ago, I read about a method to scan without scanner. It consisted of taking macro photos of the negatives and inverting them later in Photoshop. The problem was I do not have a macro lens. A month ago my father-in-law died, and my husband inherited a 70 year old lightbox from his grandmother. I tried to reproduce the method with that lightbox and the Canon 450 with EF-S 18-55mm IS lens (standard lens) handheld. It worked. Here is a strip of Ilford XP-2 black-n-white film shot in my Holga camera, Bop. This is the suspension bridge crossing the North Saskatchewan River at the Kootenay Plains along the Siffleur Falls trail. I coud not decide which image I like the best and so present the strip of three frames from the shoot. Click on the photo to see a larger version. 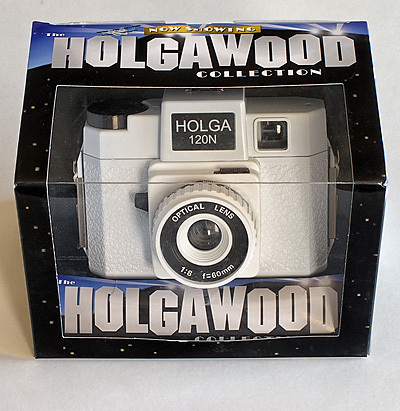 Well, the votes are in for the winner of the Holga Hustle film photo contest. Although there were votes cast across the roster, we do have a clear winner. And the winner is…Georgette! Her two photos garnered equal acclaim from you all. Georgette receives the Holga newbie kit containing her Holga (named Casablanco), a DVD and 5 rolls of film — congratulations! And thank you to all photogs who came out and played with film for the day and then shared ideas and snacks afterward at Baker Creek Bistro. Our prints are still up in the Bistro for the next little while if you want to see how great film looks printed on vinyl. Before you head out this weekend, make sure you stop over at Samantha’s blog as it is her turn to host the Fabulous Film Fridays project. Being a lawyer, she’s a very analytical type and is busy pondering the differences between film and digital. I think her film images evoke more mood than the digital comparisons in this case!